Unique mix of 9 nutrients. Extra iron for richer greener leaves. 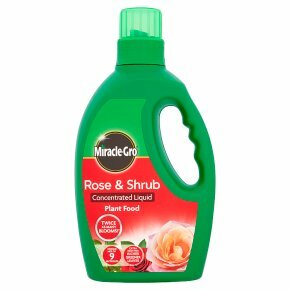 Why use Rose & Shrub Concentrated Liquid Plant Food? Twice as many blooms. * Extra iron for richer, greener leaves. * Twice as many blooms guaranteed versus unfed....carefully balanced to provide plants with essential nutrients required for optimum growth and flowering. How to use Prepare fertiliser solution: Apply one capful into 4.5 L of water. (One capful is approximately 50 ml.) Apply 1 litre/plant around the plant to feed the roots. When to use Start feeding when first shoots are about 5 centimeters long and then feed every two weeks, until late summer. Only feed when plants are actively growing. Always use gloves We recommend you always wear gloves when gardening.